We weren’t planning to do much today, so I decided to use it as a writing day to catch up on a few projects that I’d gotten behind on. I was also not planning on posting about today, either, as a result (I figure that’s bound to happen at some point). But, in the afternoon, Lindsey and my eldest went to the horse farm for Lindsey to do some portrait sessions, and my youngest stayed with me. At one point she wanted to watch some “werewolf shows.” She’s obsessed with werewolves. I don’t know why. I think it started with the wolf scene in the animated Beauty and the Beast, which got her obsessed with wolves, and then that just transmogrified into an obsession with werewolves because she didn’t quite know the difference between the two for a while. So I took a break from writing and pulled up YouTube on the TV and just searched for werewolf shows. We watched a werewolf episode of Mona the Vampire, a werewolf episode of Mighty Max, a werewolf episode of Be Cool, Scooby Doo!, and an episode of Big Wolf on Campus (which was a bit of an obsession of mine back in the day and also part of the original Fox 13 Days of Halloween lineup before it became the ABC 13 Days of Halloween before it become the Freeform 13 Days of Halloween before it became the Freeform 31 Days of Halloween). Lindsey and my eldest returned early from the photo sessions because it had started to storm. I went back to writing until Lindsey got a craving for Chinese food, so I went to pick some up. Which was the best thing I could have done today. It was the perfect combination of elements. Driving through streets in the dark and rain, seeing all the lighted Halloween decorations throughout the neighborhoods. It put me in a great mood. And then, at the Chinese restaurant, they had The Simpsons playing. I don’t watch The Simpsons usually, but I always watch its Treehouse of Horror specials. So The Simpsons equal Halloween to me in a lot of ways (also because of all the The Simpsons Burger King Halloween toys that came out at the turn of the millennium in their kids meals). By the time I got home (I’d taken the long way round to see more decorations), I was ready for a classic Halloween special: Garfield’s Halloween Adventure. 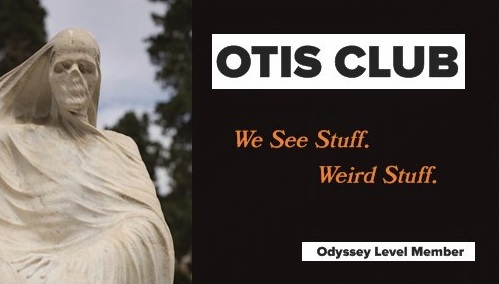 Which I’ve written about before on the OTIS Halloween Season blog here and here.